NEW SunBriteDS - Digital Signage - 47" outdoor, weatherproof LED-LCD Touch Screen digital signage board and hi-def TV. In portrait-mode. The commercial-grade Pro Series DS-4717TSP includes Enhanced Solar Tolerance (EST) technology for direct sun applications. Complete with 3M Dispersive Signal Touch Screen technology. 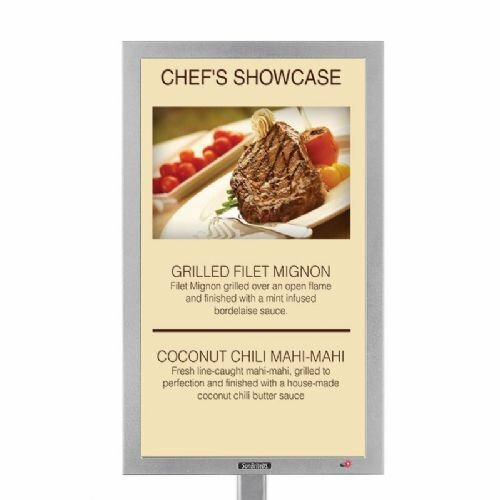 This 47" all-weather, outdoor touch screen monitor, digital signage board features a powder-coated aluminum exterior - to fend off the effects of harsh weather, a multi-fan airflow system to keep the unit cool & dry in temperatures up to 122 degrees F and down to 5 degrees F. Complete with full-HD 1080p, anti-reflective glass to shield the LED-LCD screen ... and a two-year parts & labor warranty. The DS-4717TSP is engineered for outdoor use and permanent installation outside. All SunBriteDS digital signage models are tested and proven to withstand rain, snow, salt-air, humidity, mist and insects. Perfect for cafes, walk-ways, stadium, resort locations - or any outdoor venue in need of extra communication with customers and patrons. The DS-4717TSP does not include its optional speaker bar. If sound is needed with this model, please purchase the SB-SP47P - in silver or black.